Shows the current tobacco use rates by branch of the military as well as the top reasons service members give for smoking. What Does Smoking Cost Our Military? Shows the true cost of smoking within military communities. Shows information many may not know about military communities. How tobacco affects fitness and readiness. Comparrison of Miltary vs. Civilian usage. Ways tobacco use affects military endurance and readiness. A snapshot of tobacco use among military Veterans. Explains some of the Why? and What? of Veteran Tobacco use. Information on Veteran populations in California counties. This fact sheet shows what percent of a county’s population are Veterans. Illustrates where California Veterans are located throughout the state. Features some of the basic demographic information about California Veterans. This resource is meant for anyone who works with military service members and their families. It’s designed to equip individuals who are not experts in tobacco cessation with useful tools and information to help people quit. Within the flipbook’s pages are well-cited, simple facts that can be incorporated into any job, discipline, or occupation. From the front desk staff to personal trainers to a well seasoned infantry service member, the information contained in the flipbook can serve as a resource for anyone to do a brief intervention or provide a quick phone number to someone trying to quit tobacco. Printed copies of this resource can be requested at info@projectuniform.org. This Guide was created by Project UNIFORM to assist civilians working with (or considering working with) military communities. It includes information on understanding the community, rank, uniforms, the importance of communication, ideas for outreach, and more! The health and economic costs of tobacco use in military and veteran populations are high. In 2007, the Department of Veterans Affairs (VA) and the Department of Defense (DoD) requested that the Institute of Medicine (IOM) make recommendations on how to reduce tobacco initiation and encourage cessation in both military and veteran populations. In its 2009 report, Combating Tobacco in Military and Veteran Populations, the authoring committee concludes that to prevent tobacco initiation and encourage cessation, both DoD and VA should implement comprehensive tobacco-control programs. 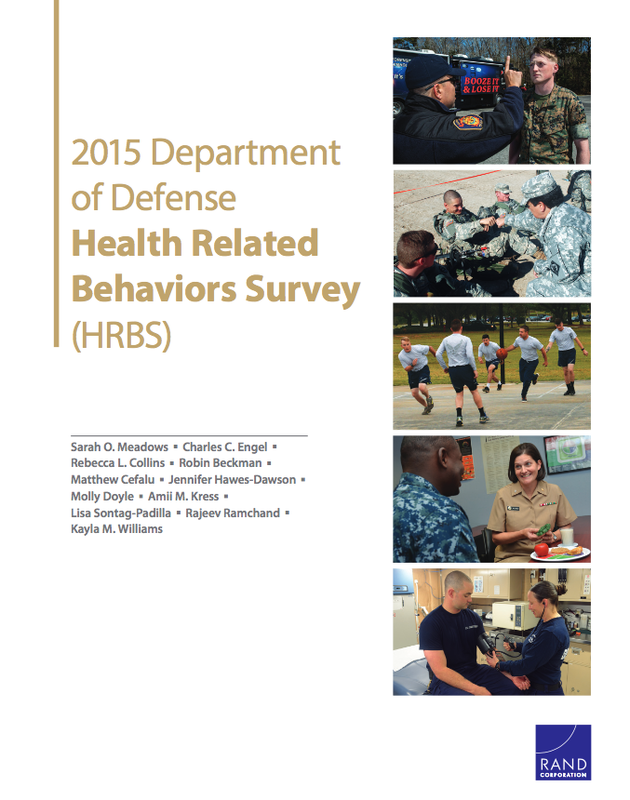 Since 1980, the Department of Defense (DoD) has collected information regarding the behavioral and health readiness of active duty military personnel through the Survey of Health Related Behaviors Among Military Personnel (HRB Survey). In 2005, DoD initiated the Department of Defense Lifestyle Assessment Program, which incorporates the active duty health behaviors study and expands the scope to include the National Guard and Reserves, as well as other special studies. Findings from the program provide information on the fitness of the force, including estimates of alcohol, drug, and tobacco use; nutrition and physical activity; and critical assessments of emotional stress and other issues. The report can be found by clicking here. In 2018, the Department of Defense released findings from the 2015 Health Related Behaviors Survey. The survey explores the health, health-related behaviors, and well-being of service members. All five branches of the military participate in the survey. The Defense Health Agency asked the RAND Corporation to administer a revised version of the 2011 survey and analyze collected data. The expanded survey assesses substance use (including tobacco) and other content areas such as mental and physical health, sexual behavior, and pyostdeployment problems that may affect readiness or the ability to meet the demands of military life. A Prezi presentation that offers basic information to help the Public Health Community better understand the realities of military communities and tobacco use. How the Tobacco Industry Has Influenced Military Tobacco Use and What You Can Do About It! Policy Memorandum 16-001, Department of Defense Tobacco Policy (April 2016): Message from former Secretary of State, Ash Carter, calling on all military branches to reinforce and enhance current policies regarding the prevention of initiating tobacco use, ensuring access to effective cessation programs, and decreasing exposure to the harm from second-hand smoke. DoD Directive 1010.10: DoD requirement to implement health promotion, disease and injury prevention programs, and population health to improve and sustain military readiness and the health, fitness, and quality of life of military personnel, DoD civilian employees, and other beneficiaries. DoD Directive 1308.1: DoD Physical Fitness and Body Fat Program - Service members shall maintain physical readiness through appropriate nutrition, health, and fitness habits (including tobacco cessation). DoD Instruction 1010.15: Smoke-free DoD facilities policy; Established smoke-free DoD facilities (with a few exemptions), designated outdoor smoking areas away from high traffic areas, ensures cessation services are available at all levels of commands, and installations shall provide anti-smoking education and messages on health risks related to tobacco use. DoD Instruction 1330.09: Armed Services Exchange Policy, set tobacco product prices to be no higher than the "most competitive" commercial price in the local community and no lower than 5% below. AF Policy Directive 40-1 (17 Dec 2009): Implemented DoDD 1010.10 and Established the framework for how the Air Force assesses, plans, delivers, and evaluates its Health Promotion Program. AF Instruction 40-101 (Updated Oct 2014): Established roles, responsibilities, and metrics for how the Air Force assesses, plans, delivers, and evaluates its Health Promotion program per DoDD 1010.10 and AFD 40-1. AF Instruction 40-102 (Updated Mar 2015): Established policies governing tobacco use on Air Force installations (i.e. tobacco-free medical campuses, designated tobacco use areas, prohibited use in uniform and privately owned vehicles) to minimize the various adverse impacts of tobacco use. AF Memorandum: Electronic Cigarette Use (17 Aug 2010): Alerted Airmen on the safety concerns regarding electronic cigarettes and considers them to be in the same category of tobacco products who use is governed by AFI 40-102. Air Combat Command Supplement to AF 40-102: AF 40-102 and its revisions as it specifically applies to the Air Combat Command and all of its subordinate commands. AF Memorandum: Smoking Cessation Program: Includes e-cigarettes in the same category of tobacco products who use is governed by AFI 40-102. Army Regulation 600-63: Prescribes policies and responsibilities for the Army Health Promotion Program; a change was added to make all Army facilities smoke-free, with exceptions for various recreational facilities. Army Regulation 600-63 Memorandum RE: Use of Vapor Producing Devices: Provides the same prohibition of vapor producing devices (i.e. e-cigarettes) as any other tobacco products. Marine Corps Order 5100.28 Tobacco Prevention and Control Program 24 Nov 1992: For reference only; has since been cancelled and replaced with SECNAV Instruction 5100.13E. Marine Corps Order P1700.29 Semper Fit Program Manual 8 Nov 1999: Provides policy and procedural guidance for the management of Semper Fit Fitness and Health Promotion programs (including tobacco cessation). MCOP1700.27B Marine Corps Community Services Policy Manual: Provides policies governing the management, operation, and administration of MCCS Programs, which includes Semper Fit programs. OPNAV6100.2A: Provides updates to the Navy's comprehensive health and wellness promotion program, promoting healthy lifestyle choices and active participation in programs. SECNAVINST 5100.13E: Provides policy and program guidance for the control and reduction of tobacco use within Department of the Navy. BUMED Instruction 6200.12A: Provides guidance governing tobacco use and tobacco cessation services within Navy Medicine. BUMED Memorandum: Tobacco Use for Navy Medicine Personnel in Uniform: Per SECNAVINST 5100.13E, Navy Medicine personnel shall not use tobacco products while in the presence of patients or while in uniform representing Navy Medicine. SECNAV Memorandum: Tobacco Cessation in DON: Reduce the prevalence of tobacco use by providing NRT's at no-cost to service members, price match tobacco products to competitive community prices, and developing a tobacco information and education campaign. VHA Directive 1057: Provides policy for the provision of free NRT for VHA employees. VHA Directive 1085 (15 March 2019): Smoke-free policy for patients, visitors, contractors, volunteers, and vendors at VA Health Care Facilities.